I understand that you were lucky enough to attend one of the recent Brad Mehldau/ Joshua Redman duo Concerts in Australia. Even better you were able to meet them afterwards and so I would love to know something about both concert and meeting. Your impressions will go some way towards assuaging the feelings of jealousy we are all experiencing. JF. Which of the three Australian concerts did you attend? MB. I saw both Sydney concerts, one was at the brand new concert hall in Chatswood (North Shore) on the 19th January and the other was at the City Recital Hall, Angel Place on the 20th January. JF. I am unfamiliar with the venues, so how was the sound quality and how were the sight lines for you? MB. The Chatswood venue was much better. I noticed immediately that the piano sound was more acoustic sounding at that venue. I spoke to Brad about that, it turns at the sound engineer was forced to use more amplification at the City Recital Hall as the natural acoustics were unsuitable for this kind of performance, so consequently the piano sounded more amplified and forced. JF. Are you also able to give me an idea of their set list? MB. Yes, Brad and Joshua played 2 completely different sets. However each night began with a composition of Brad’s, then a composition of Joshua’s, then a Monk tune. They told me later that this was coincidental. Concert 1 – Chatswood The Falcon Will Fly Again (Mehldau), Note to Self (Redman), In Walked Bud (Monk), Final Hour, Sanctus, My Old Flame, Anthropology, Hey Joe, Encore?? Concert 2 – City Recital Hall Always August (Mehldau), Highcourt Jig (Redman), Monks Dream (Monk), Unknown, Mels Mode(?) The Nearness of You, Unknown, Encore?? JF. What numbers were the standouts for you? MB. At the Chatswood concert I loved their version of Hey Joe, Mehldau played a superb contrapuntal solo, it was a great crowd pleaser . Also the opening tune, ‘The Falcon Will Fly Again’ was incredible, Redman’s fluency with this tune was outstanding, they really seemed to be on the same harmonic page together. It was interesting hearing Mehldau improvise over rhythm changes during Anthropology, I have heard him talk about the importance of not sounding clichéd when soloing over rhythm changes and to me I really felt like he was constantly searching for originality during this performance, it was extremely effective and refreshing. At the City Recital Hall my favourite track was the ballad ‘The Nearness of You’. I am particularly fond of the way that Mehldau performs ballads, this piece contained all of the things I love about his ballad playing e.g. his independent phrasing, use of the piano’s range and touch were all simply wonderful. JF. These musicians have played together before and we have heard them recently on Mehldau’s ‘Highway Rider’ and on a good number of Joshua Redman albums (plus a Kurt Rosenwinkel album). Did you get the sense that they were especially musically attuned to each other or were they just two top-rated professionals doing what they do? MB. Yes they were definitely in tune with each other rhythmically harmonically and conceptually; this was obvious from the first track. This duo has been performing together for quite some time. Brad told me that they have so much repertoire that they can enjoy a great deal of time without repeating any tunes because they have been playing together as a duo for so long now. Interestingly enough however, the style of the duo was vastly different from one night to the next. Mehldau definitely led the Chatswood concert in many ways, slightly overshadowing Redman balance wise, he played many intense solos that were often linear in texture rather than chordal. This is a generalisation of course but it conveys the idea. The City concert was more balanced, Redman played more soprano as opposed to tenor and there was more subtle interplay between the two masters. Mehldau played with colour and texture much like some of his solo work (Live in Marciac) rather than employing a linear concept. Words that come to mind are ‘soundscape’; ‘explorative’, ‘joyful’ and it seemed to be a more relaxed duo performance. Both concerts were spellbinding however, just very different. I spoke to Brad about his concept, he talked about the ‘cerebral’ process found in improvisation and described how he likes to visualise that part of his playing as being kept behind a virtual ‘curtain’ at the back of his head, always present but just hidden from view. He then went on to talk about how sometimes that this cerebral process is more prominent on some nights than others. Brad told me that this was ok, suggesting his acceptance to the fluid process of improvisation and the humanity contained within. JF. Regarding the hang; how did you manage to get invited to meet them after the gig? I can only imagine your anticipation in the days prior to that. MB. I have been in contact with Brad for several years now via email. He brought his trio to the Wellington Jazz festival and I bumped into him (literally) very briefly afterwards. He kindly agreed to answer some questions to help me with my studies. He was later kind enough to put my name on the guest list for both nights at these recent concerts but this won’t be the last time I hear him play this year. I am playing with King Kapisi at the Babel festival (March 31st) in Marseille, France. I will be flying to Europe a few days before the gig so that I can hear his trio play 3 times and one solo concert. Brad has agreed for a hang during that time too; I am very much looking forward to it as I find him to be an honest and very human person. That tour will be on – March 22nd, 2012 Bimhuis Amsterdam (Netherlands), March 23rd, 2012 Bimhuis Amsterdam (Netherlands), March 24th, 2012 Bimhuis Amsterdam (Netherlands) [*solo], March 25th, 2012 International Bergamo Jazz Festival Bergamo, ITALY. JF. Tell me about what you or others asked them and how they answered or what they spoke about. MB. After the show Brad invited my friend and I to join them both for dinner. I found both Joshua and Brad to be down to earth people who just wanted to hang out after their gig like any other working musician. JF. Did you gain any musical or other insights from the exchanges? MB. The intensity in which I was able to listen to both of the concerts has stayed with me since last month and I try to emulate the integrity and thoughtfulness that both players possess in my regular gigs. Since those concerts I have made a list of questions that I will ask Brad when I see him next, so as to better my understanding of his musical concept. Brad mentioned the necessity of finding an original voice in jazz. After studying the greats this may be the most important thing. I see originality and full emotional connectivity as being important future goals. Mark Baynes is a British born pianist. He has performed for 15 years as an international artist playing for a long list of clients ranging from the BBC and Auckland Philharmonia plus many of New Zealand’s best-known Artists. Mark leads a piano trio called ‘The Ironic Trio, their latest release is an all original album entitled ‘In Song’ with Jason Orme (drums) and Aaron Coddel (bass). This has cross over appeal. In 2009 the Ironic Trio recorded an EP entitled ‘In Colour’ which has a more traditional jazz flavour. Mark is a university tutor / lecturer at Auckland University and Massey University (New Zealand School of Music). In 2008 Mark was awarded the Ariadne Danilow Music prize (Victoria University of Wellington) and the Sir Alan Stewart Postgraduate Scholarship (Massey University) enabling him to pursue further study. Mark now holds an MMus in jazz performance (1st Class Honours) and is currently studying towards his DMA (Doctor of Musical Arts) in jazz performance. 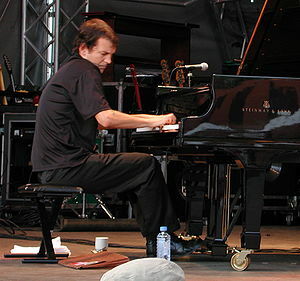 Marks DMA topic is entitled ‘Brad Mehldau’s stylistic innovations and their implications for jazz piano performance’. ‘Zoo’ is bassist Tom Dennison’s first album as leader and it is a thing of beauty. This is a concept album and such albums focus around a theme. The very best of them stimulate the imaginings as well; leading the listener into subtle dreamscapes that can shift and change endlessly. ‘Zoo’ does that. Five of the seven tracks are named after animals, but we get no sense that these are the anthropomorphic playthings of humans. The Stingray, Owl, Llama, Cat and Antelope all gain distinct lives of their own; that not withstanding the whole is greater than the sum of its parts. The first thing that the purchaser will notice is the exceptional art-work & design (by Caravan + Vivienne Frances Long). While the album can be purchased as a download, it would be a shame to miss out on the 3-fold cover or the best fidelity option. Every part of this album belongs together and perhaps that is its genius. Once again the Auckland Jazz scene has surpassed itself and with these musicians it is hardly surprising. I know and admire most of the band members and Tom could hardly have picked better. There are a number of firsts as far as I can see and this being Toms debut album, the most obvious one. I have seen Tom Dennison play around town, but the first time I saw him was at an ‘Alan Broadbent‘ concert in the Auckland town hall. When the trio played ‘My Foolish heart‘ I could imagine Scotty La Faro nodding in approval – so perfectly did Tom execute the piece. He also played with pianist Mike Nock and not long after that went to New York to study with Larry Grenadier and the equally renowned Kiwi Bass player Matt Penman. It was after this sabbatical that he returned home to work on the ‘Zoo’ album and the results of his efforts are available for all Jazz lovers to enjoy. With chops and writing skills like this he was never going to disappoint. I am pleased that the album features the New Zealand born but Sydney based pianist Steven Barry on piano. He is an astonishing musician and to have him recorded this well is pure bliss. While comparisons are often odious I cannot help but place him stylistically somewhere between Steve Kuhn and Brad Mehldau. When he played at the CJC a few months ago he floored us all. Those that knew him nodded with an “I told you so” look – while those who were less familiar became fans for life. This guy can breathe new life into any old warhorse and his own compositions amaze. He is a shaman of the keyboard and a perfect foil for the other players. He demonstrates this time and again as the album unfolds. We also get to hear him in trio format on the final track. ‘The secret life of Islands‘ is intensely beautiful and it leaves you wanting more. This is the perfect bookend to the album. Introducing a song about an Island rounds off the ‘Zoo’ concept perfectly and gives it another Kiwi reference point. In my view the song could not have been written by anyone other than a Kiwi. Also appearing is the gifted and much admired guitarist Peter Koopman Jr. Peter is both tasteful and innovative on this album and his long intelligent probing lines mark him out as a born improviser. His maturity as a player is more than evident here. Sadly for us he is to depart for Sydney in a week and that is Australia’s gain. The veteran of the lineup is Roger Manins and he always pleases. We have come to expect Roger to play like there is no tomorrow and to play what is appropriate to whatever lineup he is in. On this recording he gives us his best and that is most evident on the ballad (track 5). Any song called the ‘The cat’ was always going to work for me and I was especially pleased with this composition. Roger plays this so convincingly that it sounds like a much-loved and familiar tune. That is also due to the skill of the writing. The drummer Alex Freer is the remaining quintet member. I have not seen him play live, but he is like his band-mates, perfectly suited to the job in hand. I realise now that Alex, Tom, Peter and Steven have played together for a long time, because You Tube clips show them performing in their mid teens. This album is New Zealand’s own version of ‘Empyrean Isles‘ and like Herbie’s album I am hoping that a ‘part two’ will be recorded someday . Perhaps featuring a rare and secretive pelagic bird like the New Zealand Storm Petrel?. Those particular birds were hidden in plain view and lived a secret life on nearby islands for 100 years. This album has been discovered from the moment of its inception and it will hopefully suffer no such fate.